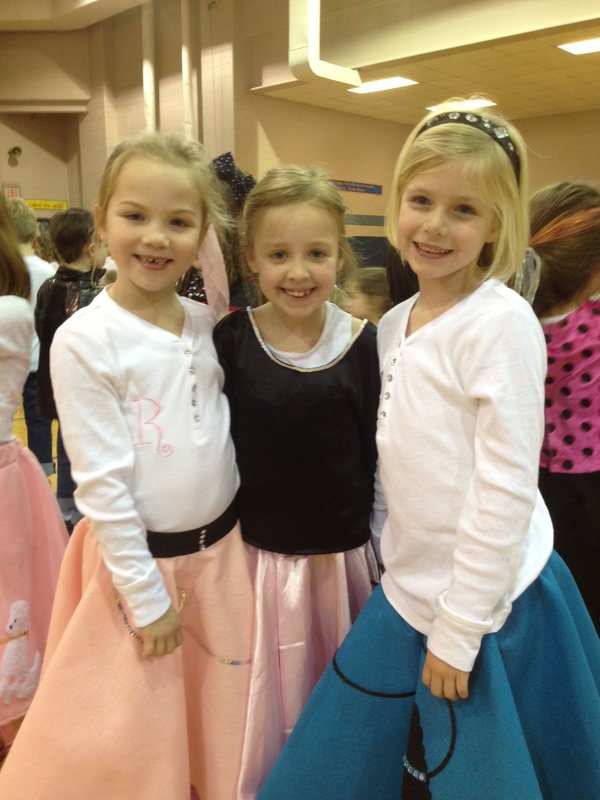 Today was the Read-a-Thon Sock Hop at Chloe’s school today. 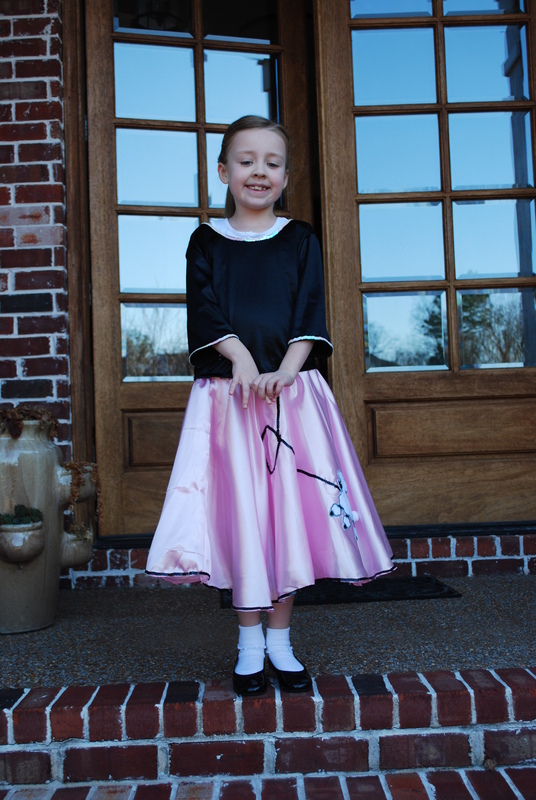 Lucky for her, the people that we bought the house from left Chloe her poodle skirt, so she was set. It was a tad bit big, but she didn’t let that stop her! 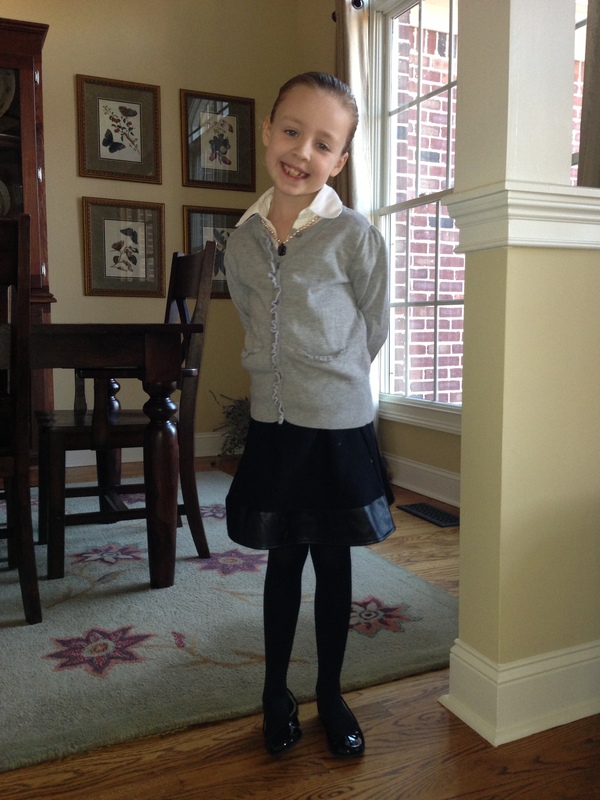 She looked really, really cute and was so excited to get to school! 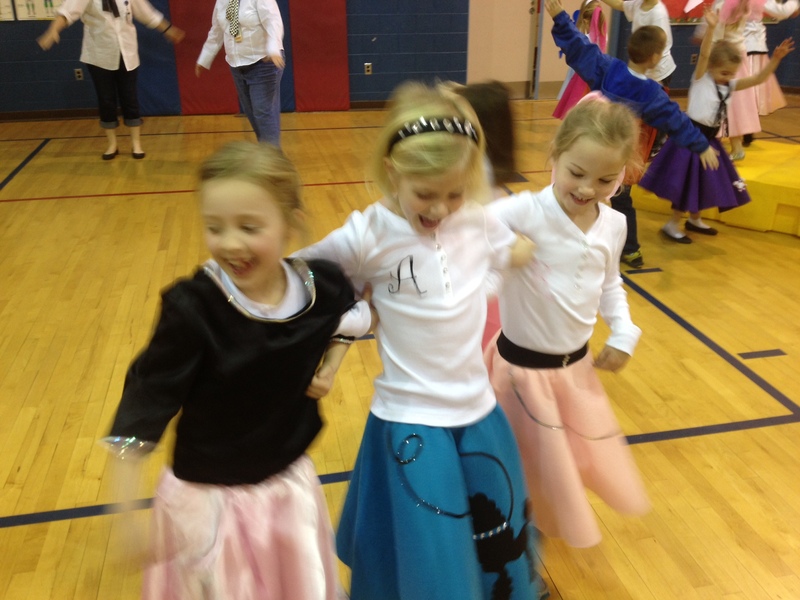 I surprised Chloe and showed up for the Sock Hop portion of the day. She was surprised and happy to see me, but honestly, she didn’t really care if I was there or not! She danced and danced and hardly noticed me at all! She was able to stay until 5:00 to enjoy the festivities of the day. When I asked her earlier in the week if she wanted to stay, she thought I was crazy to even ask her. Of course she wanted to stay! Her bus dropped her off at 5:15, and she was a smiling mess. 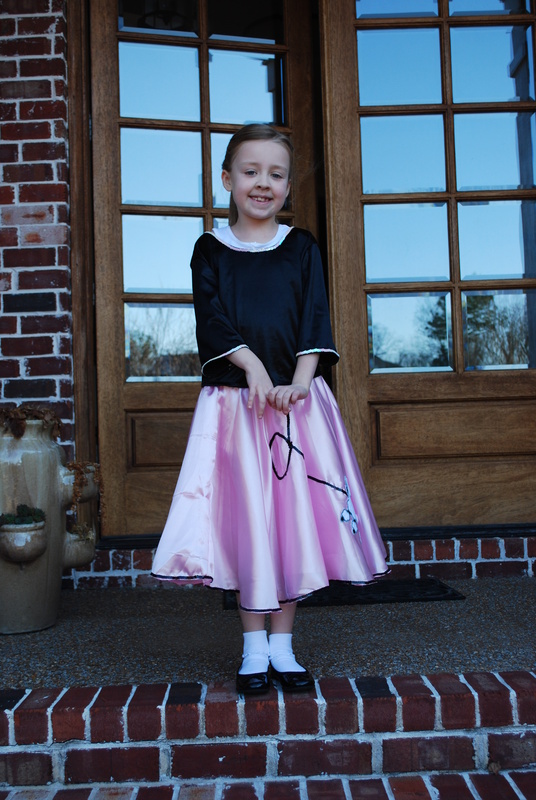 Her ponytail was barely hanging on, her hair was all in her face, and her skirt was turned around backwards – but she was one happy little 1st grader! Chloe was in the first grade play tonight, and she had the part of a meteorologist. The first grade class was all in the play, and the play was about weather. It was a musical with speaking parts. She had a speaking part and did so well. She didn’t seem nervous or shy on stage and enjoyed all the singing and dancing. I went and saw it at school during the day. After she got home from school, we went out for dinner and Pappy and Papa met us. We all went to school for the play, and Chloe had all her grandparents there as well as the 4 of us. The school was packed, and all the kids did so good! She just may have been the cutest meteorologist I’ve ever seen! Finally….. FINALLY we’ve had a nice day to get outdoors!!! It was still chilly and we were all cold, but it didn’t stop us! We couldn’t wait have some high 50 temperatures to enjoy! Christy, Anderson, Scotty, and Loulou came over, and they walked to the park with Caroline, Cole and me. We had a picnic lunch and played on the playground. I wish I had more pics, but my phone was full after I took this one (I must download them!). 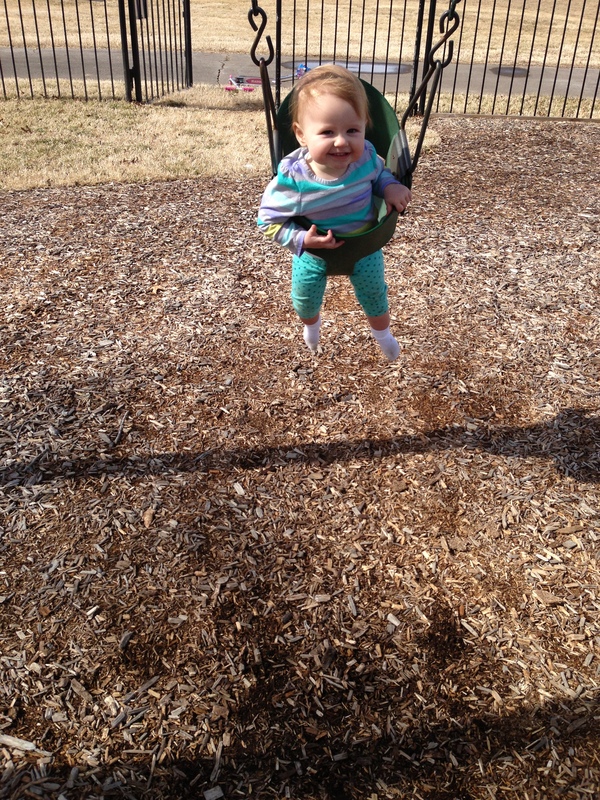 Caroline and Loulou loved the swing, and they were both full of smiles and giggles! Happy Valentine’s Day!! Here is the one and only picture I got of the day…. It was a busy day. Christy and I had to run since we are training again for CMM. 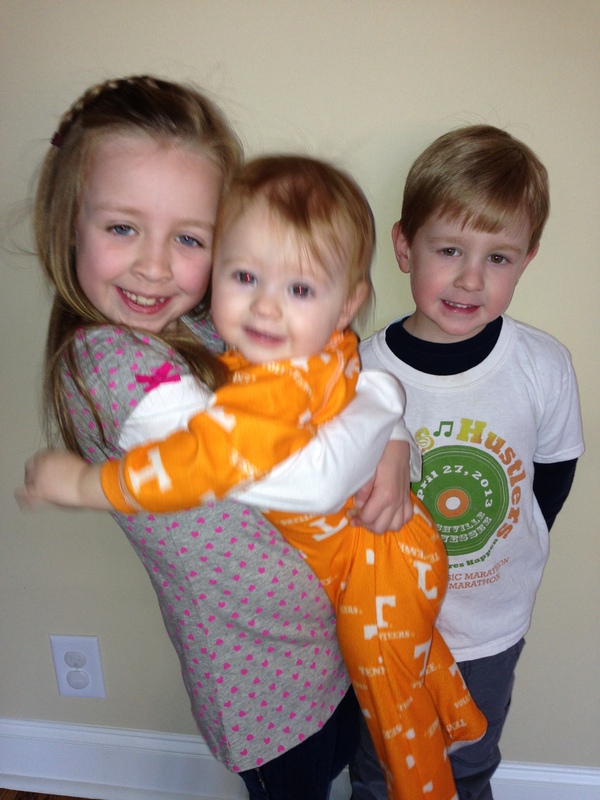 Then, we rushed home, got ready, and we went to Cole’s Valentine’s party for a bit. I took him a bit early, and then I met Matt at Chloe’s school to go to her party. Well, Cole was worn out and ended up having a major melt down as we were walking into Chloe’s school (and it was raining and it was freezing), so I sent Matt on to the party while I came home with Caroline and Cole. I put Caroline down and made Cole take a nap. He ended up falling asleep and sleeping for over 2 hours – which explains his meltdown. The boy was TIRED! Matt dropped Chloe off, went and played basketball, and when he got back we couldn’t decide what we wanted to do for dinner….. so guess where we ended up? Of course – Mexican! After dinner we gave the kids their treat from us, which was a small chocolate heart cake. They were pleased….. and now we have a ton of chocolate Valentine’s in the house from the kids’ parties to go along with that cake. It’s too much! All the girls got together tonight and took Jennifer out to Mexican for her 40th birthday. 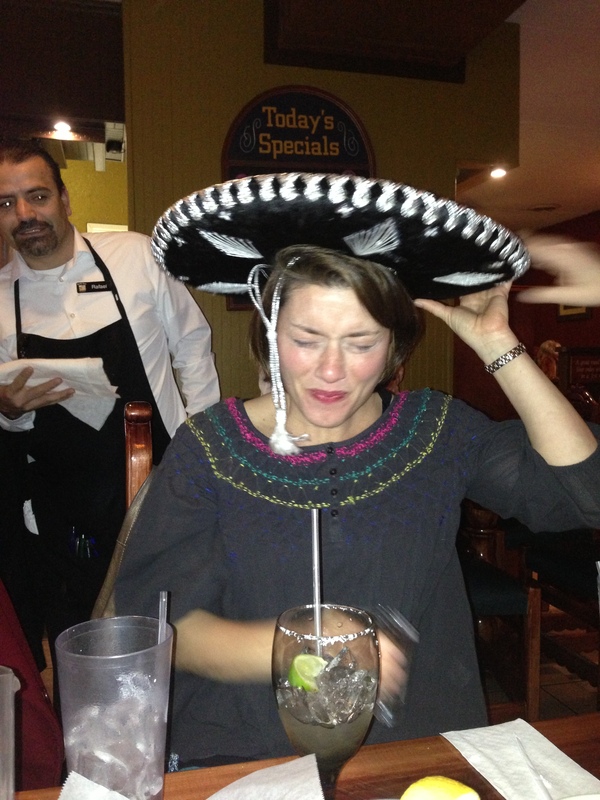 It was a low key night, but the servers made sure Jennifer got a good ol’ shot of tequila for turning the big 4 OH. I got a pic at the perfect time…. I woke this morning to the msg that school was cancelled today. Yay! But instead of getting up and looking out the window, I rolled over, turned the alarm off, and went back to sleep. When I did wake up a little later, this was the scene outside. 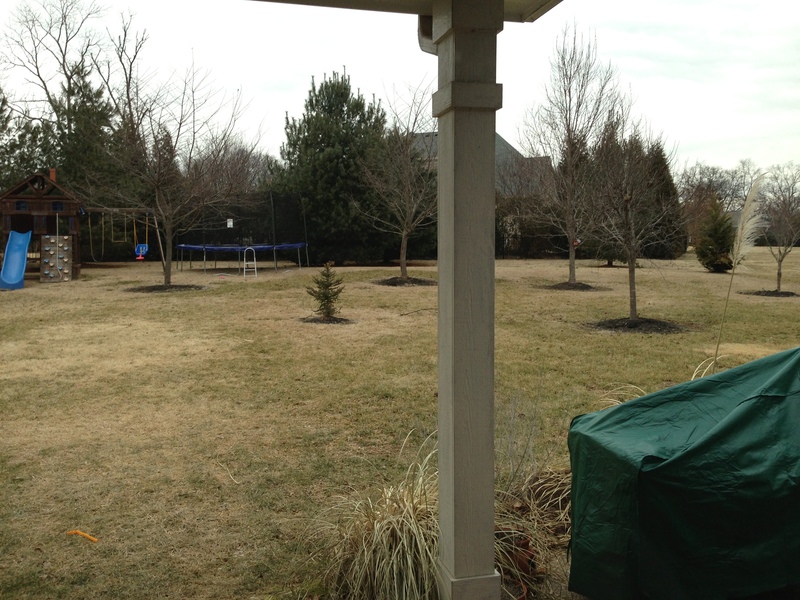 Where in the world is the snow!?!? 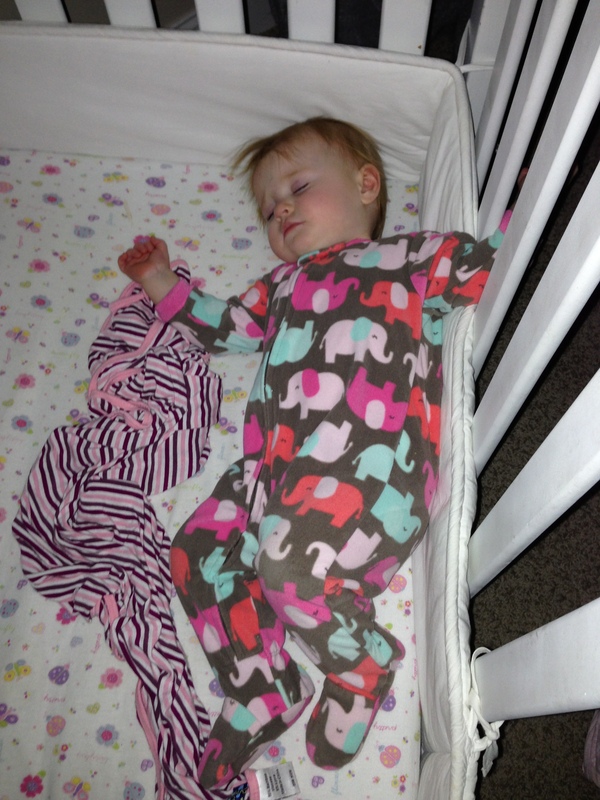 I just love seeing her sleep – this time with her arm out of the crib. Sweetie.